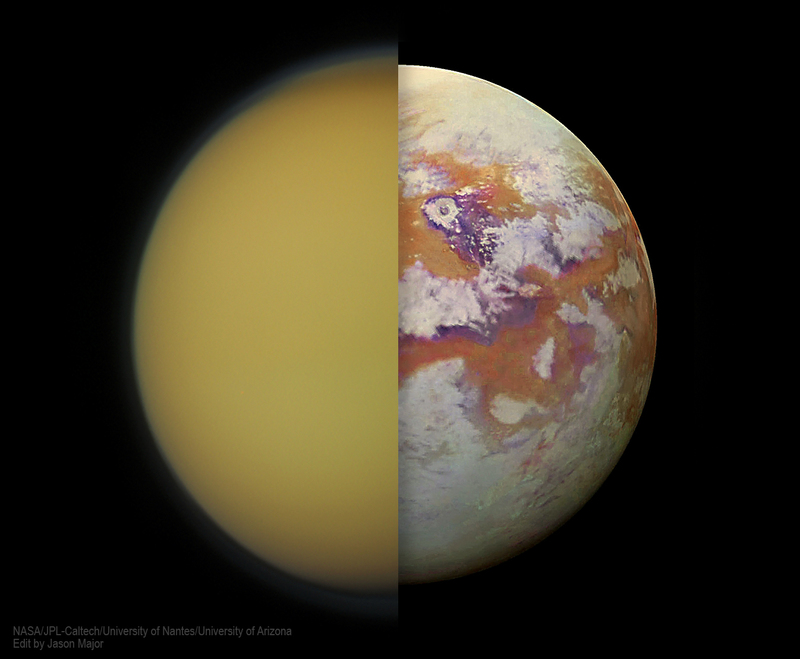 Titan in visible light (left) and newly mapped in infrared (right), with its atmosphere removed. Saturn’s largest moon Titan boasts the distinction of being the only moon in the solar system to have a thick atmosphere…so thick, in fact, that its surface is perpetually hidden from our view—but not from the view of the Cassini spacecraft’s infrared cameras! Cassini, now over ten months gone after its Sept. 2017 plunge into Saturn, spent thirteen years in orbit around Saturn and during that time used its VIMS (Visual and Infrared Mapping Spectrometer, run by the University of Arizona) instrument during over 100 close passes by Titan, penetrating its optically-opaque cloud cover and gathering data on its surface features. Previous IR and synthetic-aperture radar maps of Titan were made from data acquired in relatively small sections at a time over the course of multiple flyby events. This resulted in a monochromatic patchwork-like result with hard seams between the observation sets. 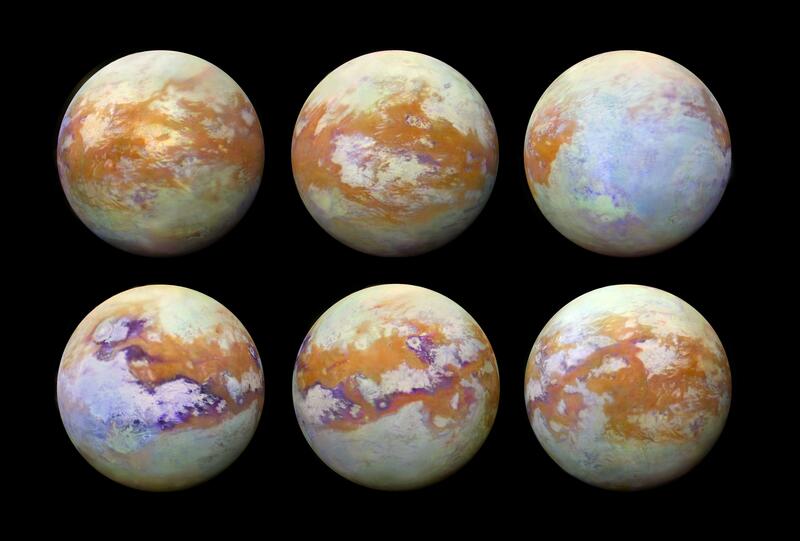 These new images have removed the seams and blended the areas together across the entirety of Titan’s 5,150-kilometer-wide globe, and the results are truly beautiful. Regions of dark dune fields around Titan’s equator and mid-latitudes appear a rusty orange color, and regions of exposed water ice (which is like solid rock in the frigid temperatures found on Titan) are in light blue and purple. 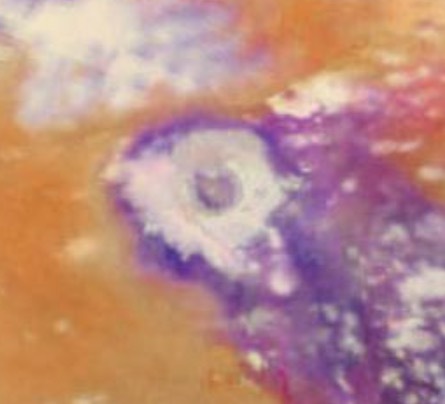 The 80-km-wide Sinlap crater and its surrounding area on Titan is seen in this synthetic color view. While not “true color” the variations do help highlight the variations in surface types across the moon. Because of Titan’s thick hydrocarbon atmosphere, visible wavelengths of light just can’t make it down to the surface and back to a spacecraft’s camera so a workaround had to be devised using wavelengths that can. Work like this just shows how data from Cassini will continue to lead the way for new discoveries about Saturn and its family of moons, even after the spacecraft itself has long since become a part of the ringed planet itself. You can find this and more images and news from the Cassini mission here. Previous Post Ten More Moons For Jupiter!